There’s something about spring that makes me want to wear a nautical stripe, this year the feeling’s been heightened by having seen the Jean Paul Gaultier exhibition. JPG has always done stripes brilliantly well, the above couture silk stripe gown from the Romantica collection took 160 hours to make and was worn by Princess Caroline of Monaco to the Rose ball in 2000. Lovely, but not entirely practical, although there’s a selection of wearable striped Ts available from the exhibition shop (sadly not online). This season, stripes are looking better than usual, I’m not sure if they are having “a moment’ as such, but lots of brands have some great ones this year which might be worth grabbing. 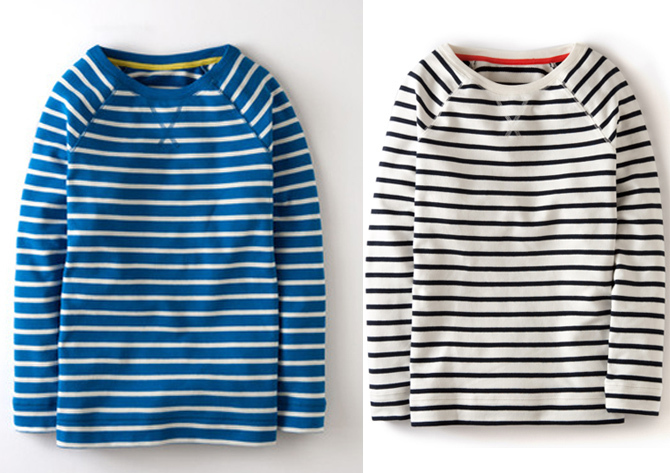 A stripe T, after all, is a classic so as with all classics, best to get them while they are being done well. Some of our favourite brands have good ones. Starting with COS, above, which actually has a number of great shapes and stripes, all in good fabrics (I’ve been in and given them a feel…) worth investigating. I liked the simple and classic 3/4 length sleeved jersey one at £25. 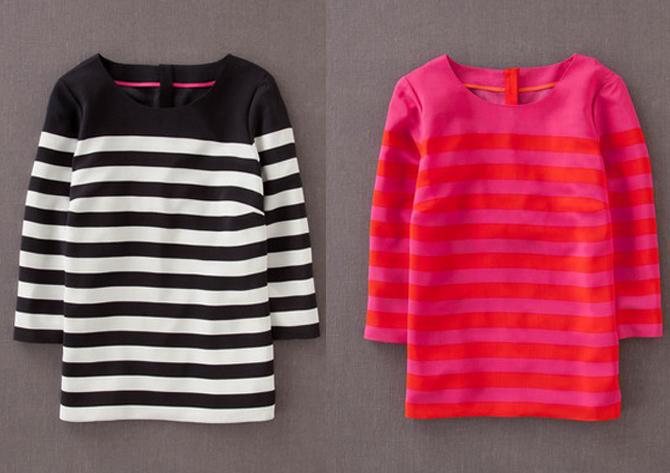 Boden has made itself a master of stripes and it should be your go-to brand to line-check first (couldn’t resist, sorry). We loved the Boden range when we saw it at the press day last November; conscious perhaps of J Crew’s new presence, we felt Boden had really upped its game. 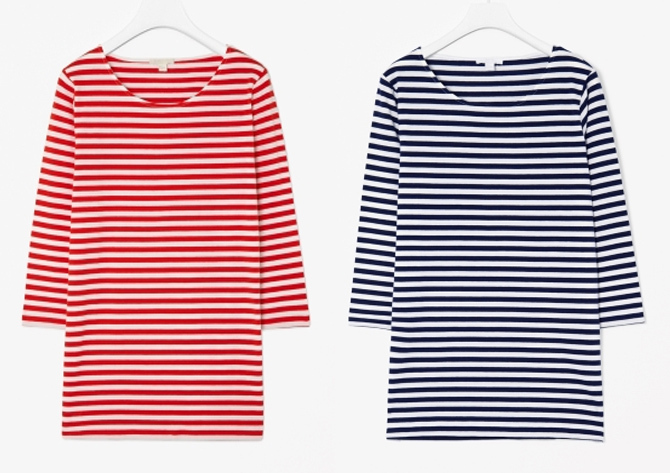 There are great colours and prints this season too, however, I still love the stripes, particularly the colour combos on the modern breton stripe, who wouldn’t feel chic in the Navy/white stripe or joyfull in the scarlet/fuchsia version, at £44.25, below? I’m also taken with the stripy sweat shirt version, below and currently reduced to £27.50-ish, as y’all know sweatshirts are ‘smart’ currently, right? 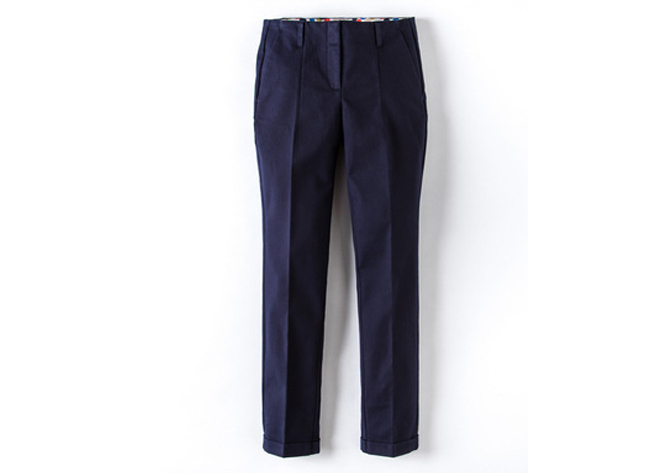 Also, Boden does proper sizes and frequently goes up to size 22, unlike otter high street retailers we could mention. 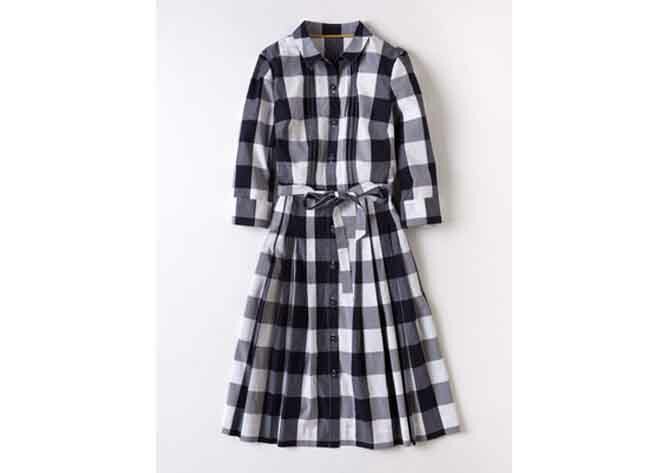 If you are not a T shirt wearer, then how about this giant gingham check shirt dress in soft cotton? 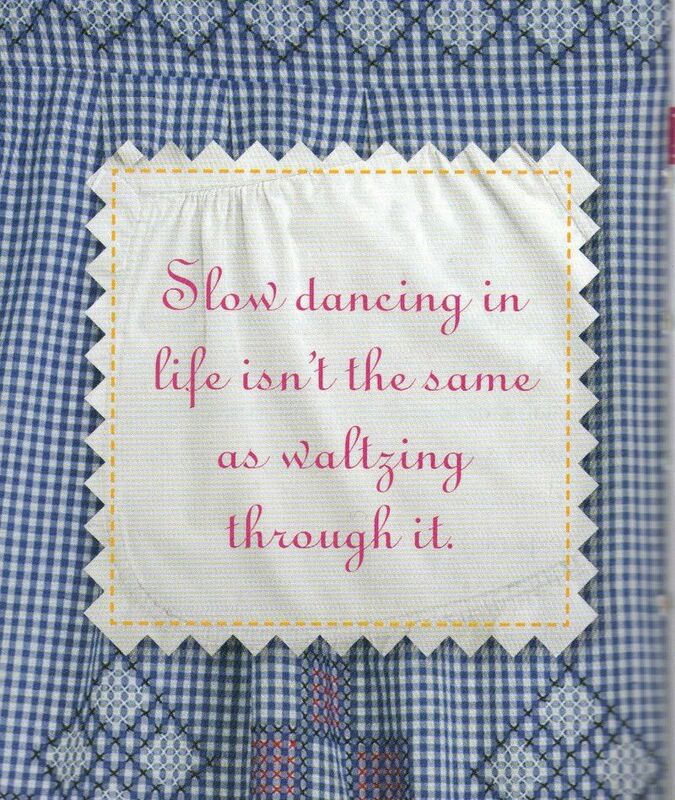 I’ve got such a soft spot for gingham, I think it’s to do with my school uniform summer dress (green gingham with self covered belt), I only got to wear it for about 5 weeks of the year and it was by FAR the nicest bit of our uniform wardrobe. The over sized gingham makes it a bit more modern. 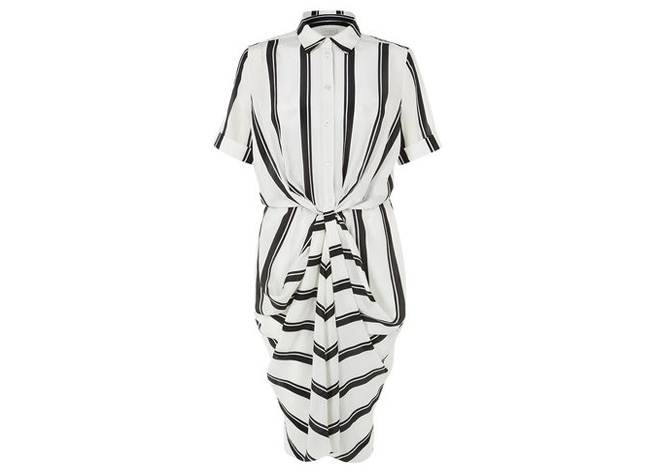 For a really neat twist on a stripe, think about this Hobbs Amaya dress below, it’s much lovelier -less stiff-looking- in real life, I saw it in the Covent Garden shop last week and it’s softly elegant and really easy to wear, definitely a great work dress. 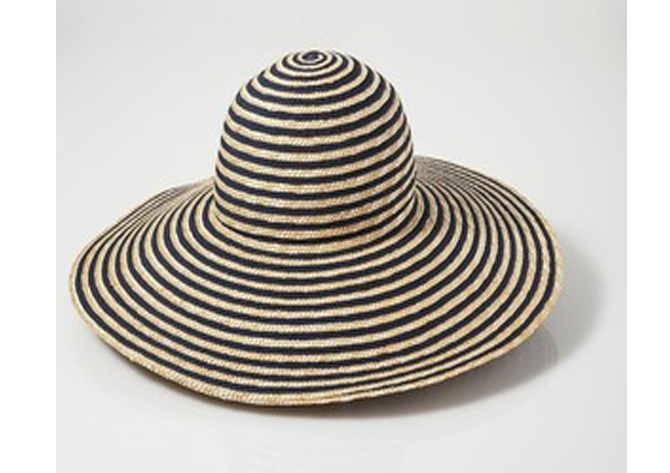 Alternatively, you could just opted for a striped sun hat, such as this Porto one, to add a dash of classic nautical chic to any plain number. Previous articleThe new retail: Clicks then bricks? Next articleFashion Revolution, Who Made Your Clothes?